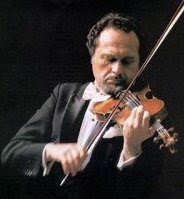 Aaron Rosand is an American violinist born on March 15, 1927 (Heifetz was 26 years old.) He is known for his pure, lustrous tone, for championing (classical) Romantic music, playing in the Romantic style, and for his many years of teaching at the Curtis Institute (Philadelphia.) Rosand first studied with Leon Sametini (a pupil of Ysaye) in Chicago and later with Efrem Zimbalist (a pupil of Auer) at the Curtis Institute. He made his debut with the Chicago Symphony at age 10. He has been concertizing all over the world ever since. He is among the very few to have recorded the violin concertos of Jeno Hubay, Anton Arensky, Klaus Egge, and Claus Ogermann. Among his extensive discography is an unusual one featuring, among many other things, the violin Romances by Liszt, Svendsen, Sinding, Janacek, and Nielsen. He can be seen and heard on several videos on YouTube. On October 14, 2009, Rosand sold his Guarnerius violin (1741 - the Kochanski) for over ten million dollars. He had been playing it since 1957. As far as I know, it is still not known who purchased the Guarnerius.